The Peppermint Shrimp is best known for its natural ability to manage nuisance Aiptasia, or glass anemones. Keep in mind that some individual Peppermint Shrimp are better at managing aiptasia while others may not be interested in aiptasia at all. Though considered part of the "cleaner" grouping of shrimp, Lysmata wurdemanni is more of a scavenger. The Peppermint Shrimp picks its way around your aquarium and live rock to consume detritus, uneaten food, and decomposing organic material. This ornamental member of the Hippolytidae family is brightly colored with a creamy white body striped with several thin and distinct longitudinal red bands. Also known as the Veined or Caribbean Cleaner Shrimp, the Peppermint Shrimp is sometimes confused with its Pacific cousin, Rhynchocinetes durbanensis. However, that shrimp has a pointed nose and inter-spaced white stripes over its body. In the wild, Peppermint Shrimp are usually found in the vertical shafts of the reef. Some even take up residence in the core of pipe sponges. The Peppermint Shrimp does best in home aquariums with live rock, ample places to hide, as well as open areas to scavenge. Peppermint Shrimp are very social and peaceful towards most reef inhabitants. Like other invertebrates, the Peppermint Shrimp cannot tolerate copper-based medications or high nitrate levels. It also requires supplemental iodine to encourage proper molting of its carapace. In addition to what it obtains from scavenging, the diet of the Peppermint Shrimp should consist of most types of prepared foods and the occasional pieces of fresh fish. 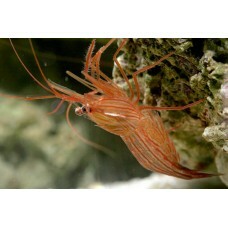 The Peppermint Shrimp has been successfully bred by commercial fish farms, and can be bred in the home aquarium. Rearing the larvae requires specialized feeds and care outside of the display aquarium. The Western Atlantic Peppermint Shrimp complex Lysmata wurdemanni has been reclassified in 2006 by Andrew L. Rhyne and Junda Lin based on their morphology and color pattern. See the article here. In general, peppermint shrimp from different regions can easily be identified to species level by their color patterns. Our peppermint shrimp are from either the Florida Keys or the Gulf of Mexico and are most often Lysmata boggessi, a species proven to consume Aiptaisa (Rhyne et al. 2004). We occasionally receive other species from the Lysmata wurdemanni complex. We have consulted with Dr. Rhyne and he has confirmed that all species of peppermint shrimp he has tested in the laboratory consume Aiptasia. Differences in exact collection location often dictates what species we have in stock. The exact species that will be shipped to your door is one of the following listed below. The exact species you receive will vary based on the time of year, weather conditions, freight space, and inventory levels. All of the following species make ideal scavengers and prey on the pest anemone Aiptasia pallida.